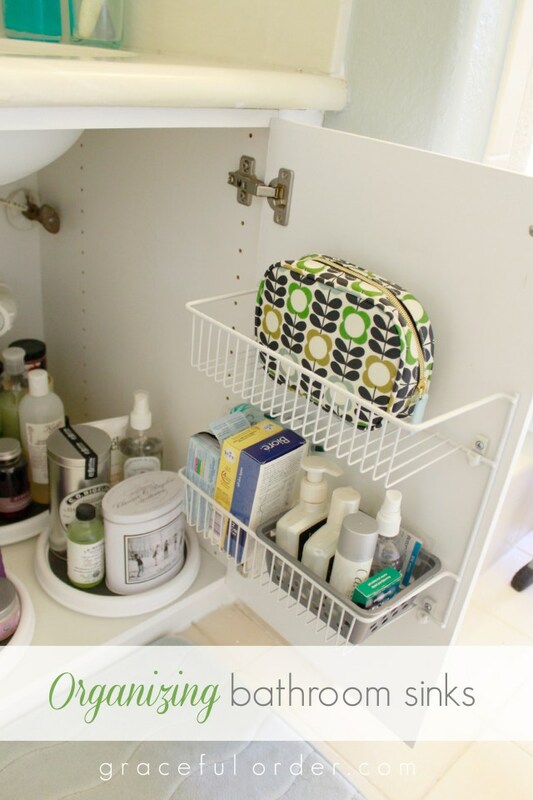 Are you running out of places to store things in your bathroom? 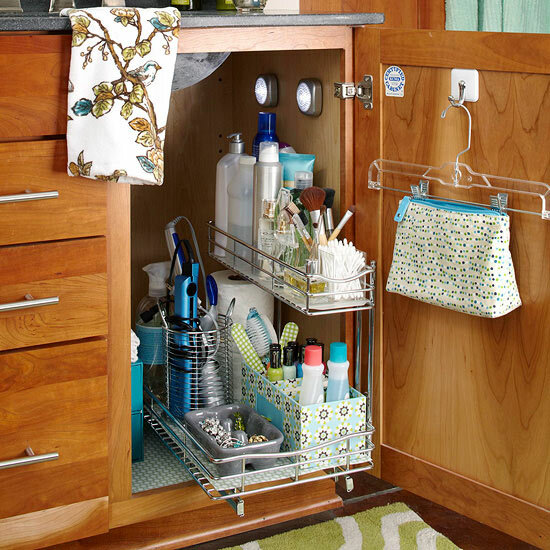 Do you have a super tiny bathroom with almost no storage space? We’re here to help! 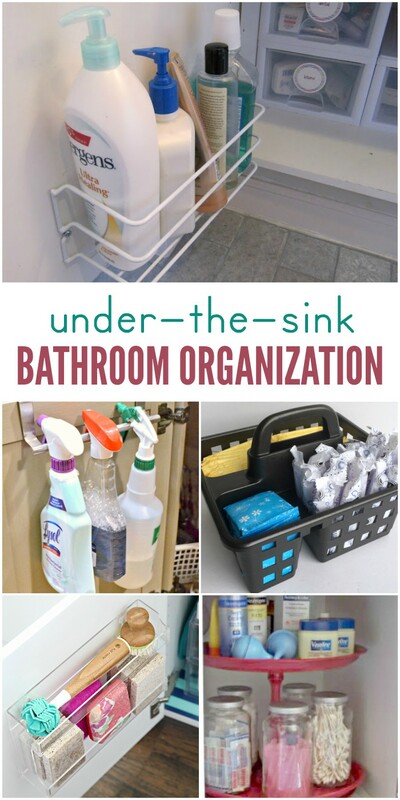 These under the bathroom sink storage ideas are genius! Even if you have the tiniest little cabinet in your bathroom, you’ll find lots of useful tips for making the most of your storage space. 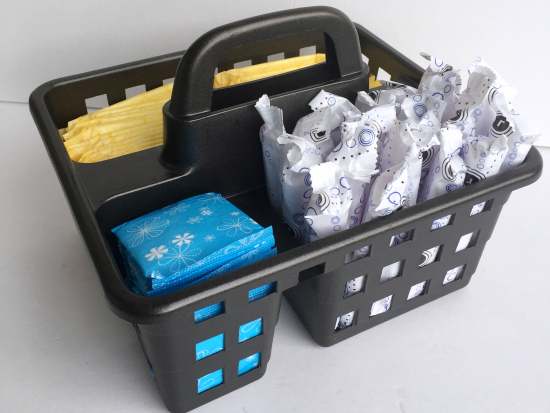 Use a shower caddie with several compartments to organize your feminine hygiene products. 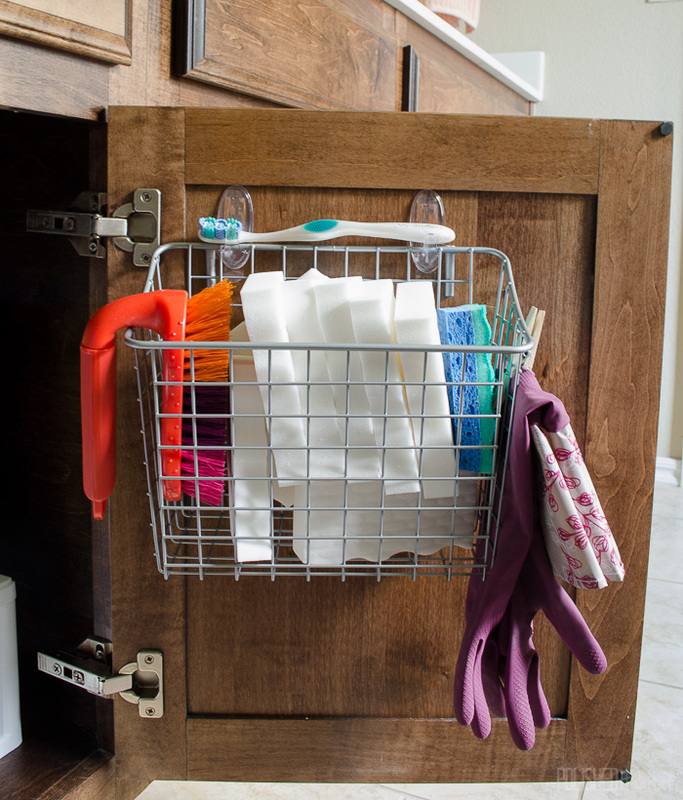 Attach wire baskets to the backs of your cabinet doors to utilize unused space. Smart! 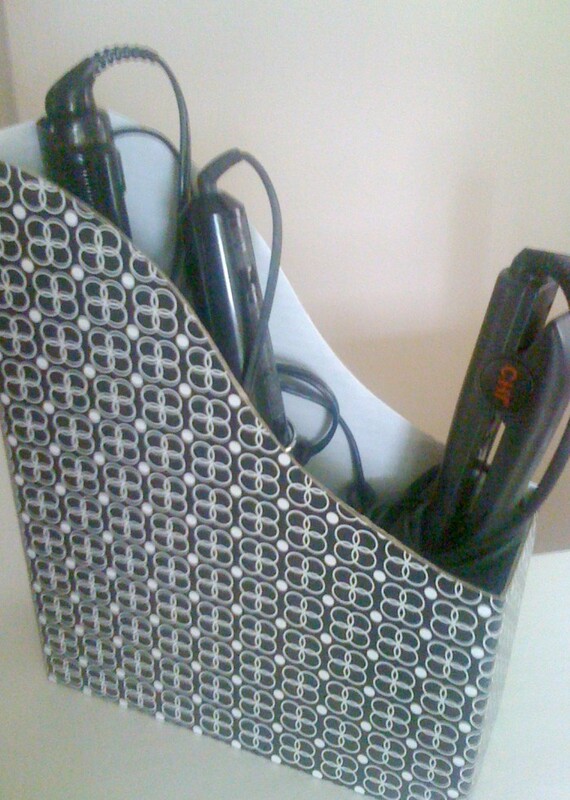 PVC storage for your hair styling tools is brilliant. 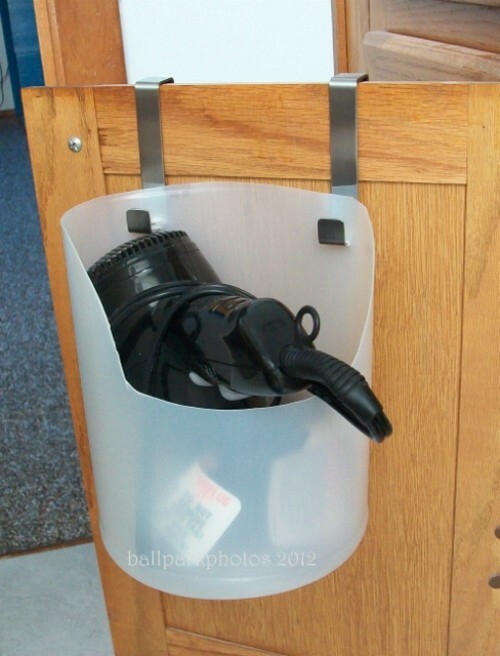 Or cut out a plastic jug and put it on hooks to store your hair dryer. Great way to save a few bucks! 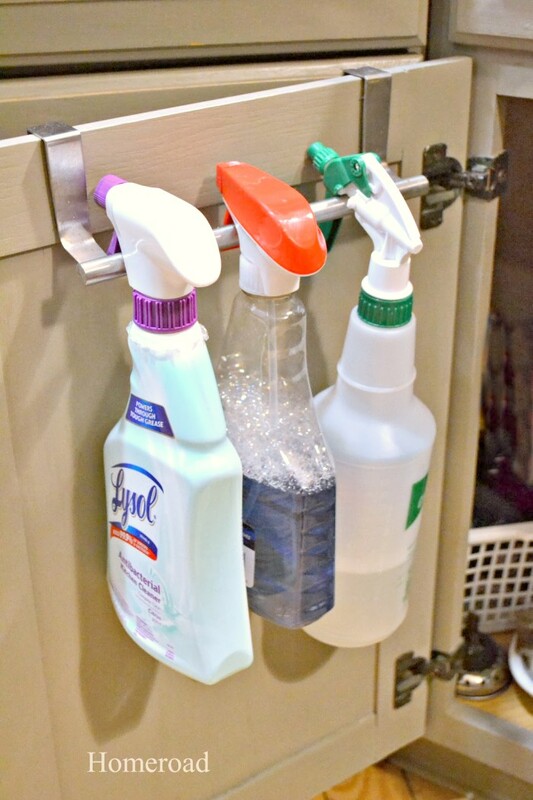 Use command hooks to keep your cleaning tools organized. 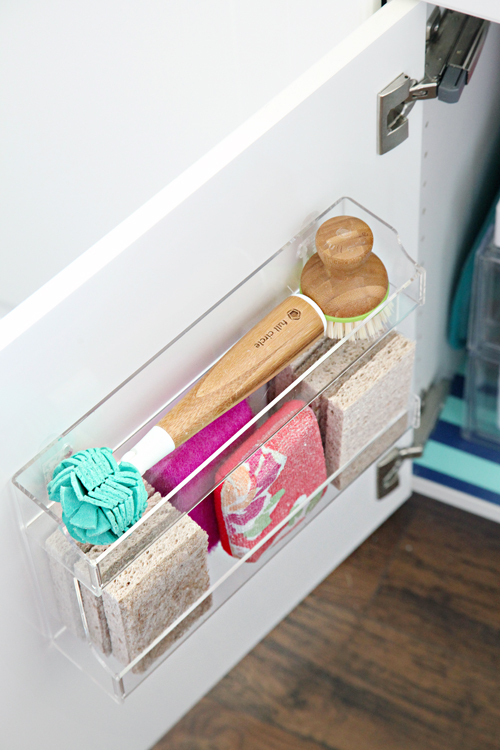 Slide a file holder under the sink to hold your daily hair styling tools. 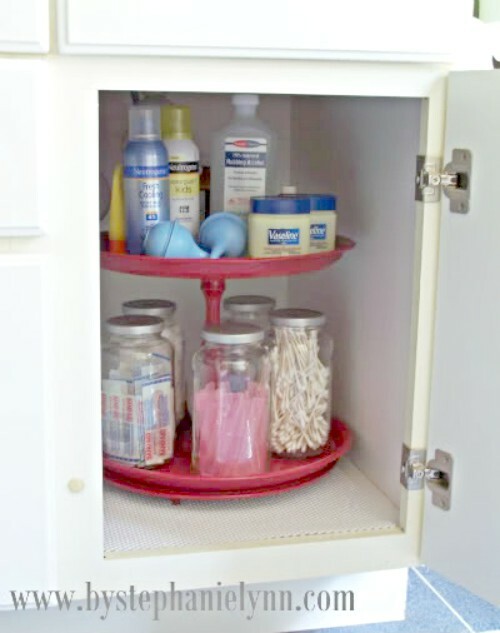 Get a small pocket organizer (or cut a larger shoe organizer in half, and use thumbtacks to hang it) to store hair accessories or cleaning supplies on the back of the cabinet door. Bins are a practical choice, and you can see that she uses plastic dividers in them to compartmentalize her hair products and mani/pedi products. 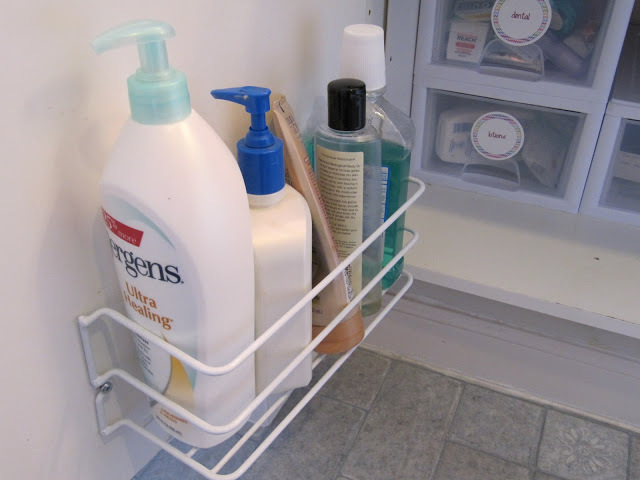 Install a wall-mounted rack to the back of your cabinet to store lotions and other toiletries. 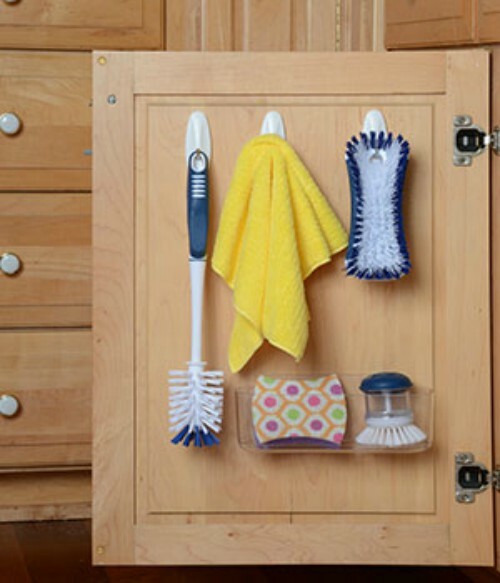 Turn an over-the-cabinet bar around, and hang your most frequently used bathroom cleaners there. Cleaning the toilet in a pinch has never been easier! 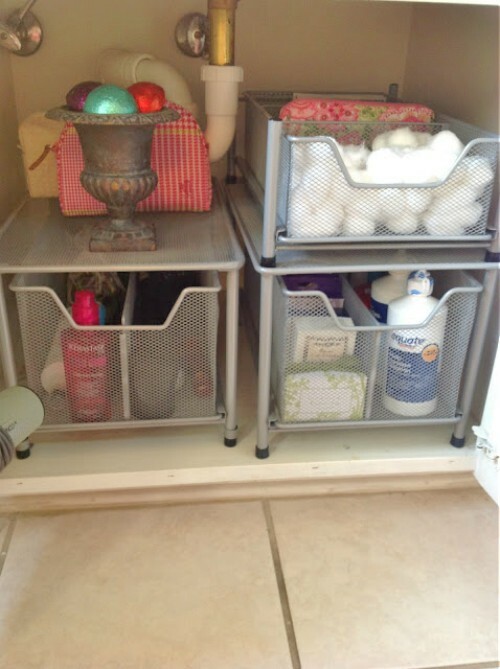 This is a great idea for the bathroom or kitchen: an acrylic spice rack! 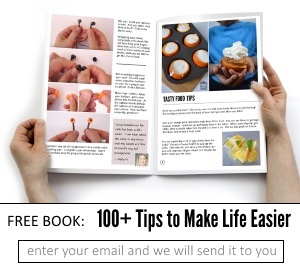 Use it to hold sponges, cosmetics, etc. This wire organizer is installed using command hooks, but it holds so much! There’s a huge magic eraser stash, a scrub brush, sponge, a toothbrush for cleaning, and the cleaning gloves are clipped to the basket with a clothespin. So practical. 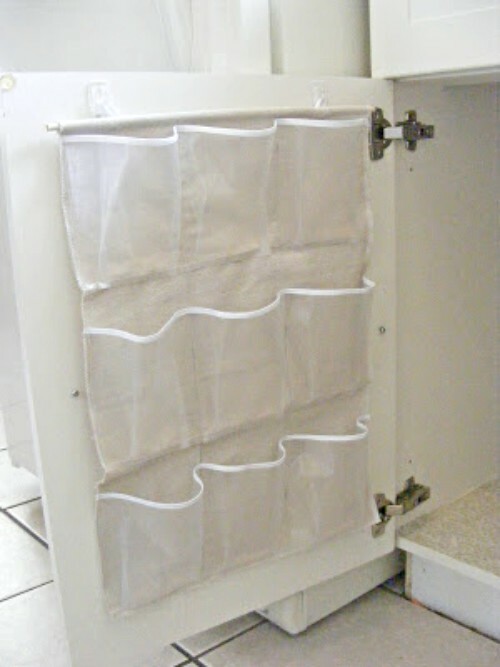 Use a clothes hanger with clips to hang your cosmetics bag on the back of the cabinet door. 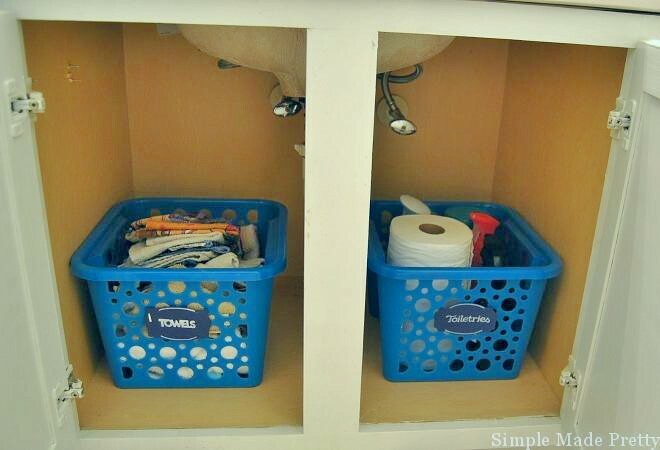 Simple baskets can make it easy for guests to find towels, washcloths and the toiletries they need when visiting. 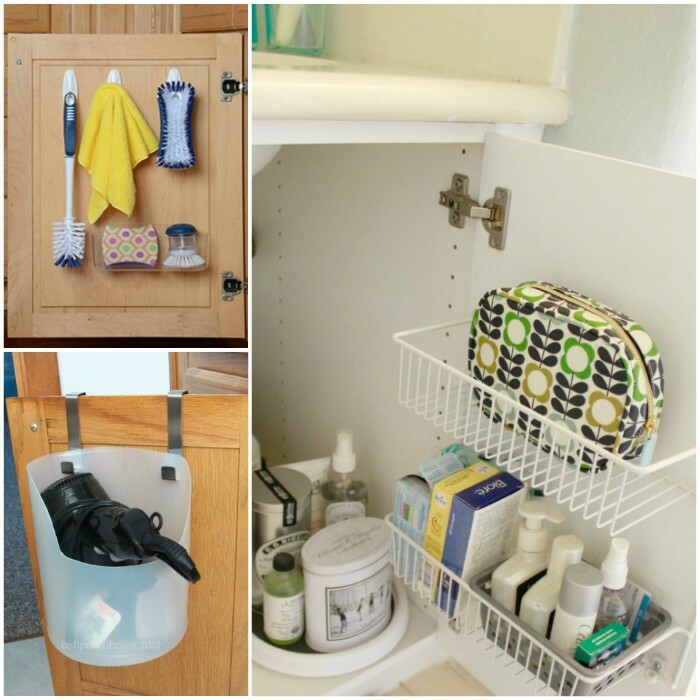 Like these under bathroom sink storage ideas? You’ll love these posts, too!